Tired of putting up with all the crap that haters say about her, Miley Cyrus got an ear tattoo that reads, simply “Love” in capital letters. Miley got the small ear tat at 17, and claims that it was intended as a reminder to only listen to the things that people who love you say, and to forget about everyone else. 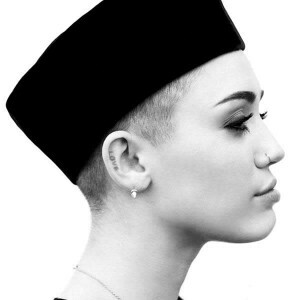 Doesn’t the inspiration behind Miley Cyrus’ ear tattoo make her sound so wise and mature? Oh wait, we forgot; the young star also mentioned, “My dad was getting a new tattoo on his arm and I thought it sounded cool.” There we go. We all know when Miley Cyrus feels passionately about something. How, do you ask? Because she gets it inked on her body. The singer’s second tattoo features the word “Love” inked in small capital letters on the inside part of her right ear. Pictures of Miley’s “Love” tattoo surfaced on the internet in May 2010, but she had actually gotten the tat several months earlier. Wondering how Miley got permission to get yet another tattoo while under the legal age of 18? Miley Cyrus’ ear tattoo was actually inked at the same time that her father, Billy Ray Cyrus, was adding to his own tattoo collection. That’s one way to spend quality time together. 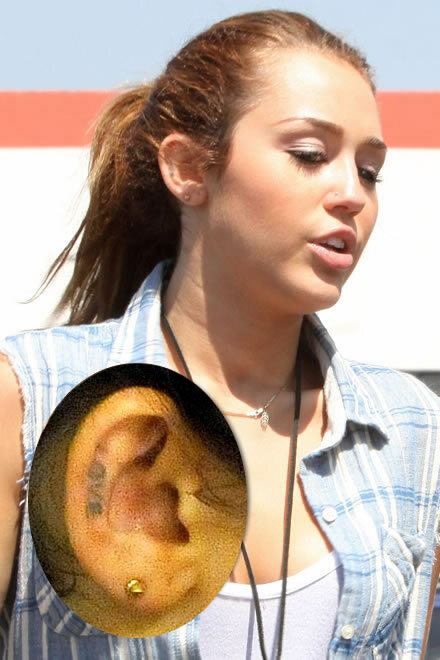 With her new ear tattoo, only the second of many body tattoos, Miley Cyrus effectively rid herself of the innocent, good-girl image that came along with playing Hannah Montana on television. And while some people may not like the idea of a young role model covering herself in ink, Miley reminds us with her love ear tattoo that she refuses to listen to anything negative people have to say. Getting ink on the inner ear has got to be painful right? But it seems like a popular spot for celebrities to stamp a permanent expression of who they are or what they believe in. Another mega-superstar who opted for a tattoo inside the ear is Rihanna. Rihanna’s ear tattoo features a small black star outline inked in a similar location on the inside of her left ear. If Rihanna did it, it must be cool, right? Well, according to Miley, in reference to her ear tattoo, “I have ‘Love’ right here to block out all the crap that everyone throws into your ears. I don’t really care about it. [You’re] only supposed to hear the things coming from the people that genuinely love you.” Miley Cyrus’ love tattoo isn’t the only ink she has added to her body lately in support of peace, love and equality. She also has finger tattoos symbolizing…peace, love and equality. Whether you’re interested in learning more about the pop star’s tats or not, it’s hard to ignore the influx of Miley Cyrus tattoo pictures in recent years, as the young star consistently adds to her ever-growing collection of ink. And if Miley has it in her head to be just like her half-brother Trace, you may be reading about new Miley tattoos for the next few decades at least. But you have to give the singer props for standing up for what she believes in and at least attempting to ignore the stuff that doesn’t matter. According to Miley, “There’s so much negativity in the world and what you only need to hear is all the love. People try to say to me, ‘I just heard someone say this or that about you,’ and I just ignore it because it’s irrelevant. Love is what makes the world go around, and that’s all we need to focus on.” Maybe the pop star’s ear tattoo will discourage others from letting negative comments get them down and ultimately promote positivity, like she hopes. Miley Cyrus has mentioned that her ear tattoo was all about only listening to the things that people who love you have to say. Could one of these people be Australian beau, Liam Hemsworth? The two met while filming Miley’s movie, “The Last Song” in 2009, and Miley Cyrus’ love tattoo showed up shortly thereafter. “The last thing I was expecting was to fall in love,” Miley has said about Liam. “But I guess God was like, ‘Girl, here is this amazing guy.’ Liam has become my best friend in the whole wide world. I love him.” If Liam was the inspiration for Miley Cyrus’ tattoo in her ear, it certainly isn’t the only one! The couple reportedly got matching skull tattoos on the inside of each of their right feet. We wouldn’t be surprised if her blossoming relationship with Liam inspires Miley to get yet another tattoo!